Download "FEES POLICY. A. 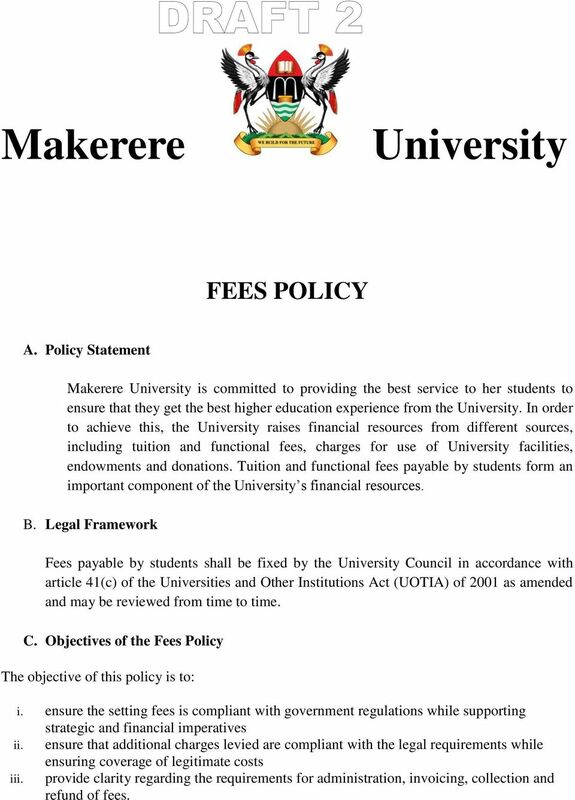 Policy Statement"
1 Makerere University FEES POLICY A. 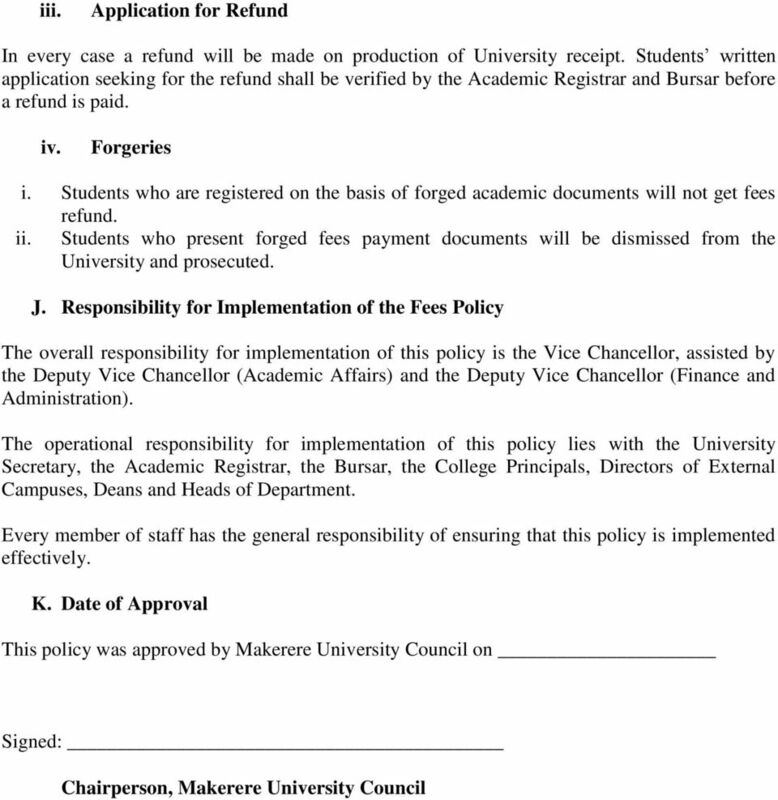 Policy Statement Makerere University is committed to providing the best service to her students to ensure that they get the best higher education experience from the University. In order to achieve this, the University raises financial resources from different sources, including tuition and functional fees, charges for use of University facilities, endowments and donations. Tuition and functional fees payable by students form an important component of the University s financial resources. B. 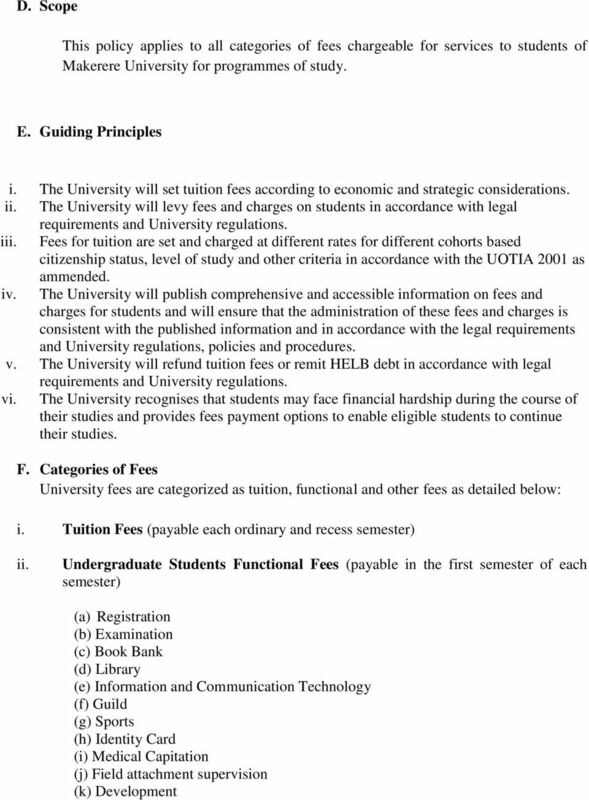 Legal Framework Fees payable by students shall be fixed by the University Council in accordance with article 41(c) of the Universities and Other Institutions Act (UOTIA) of 2001 as amended and may be reviewed from time to time. C. Objectives of the Fees Policy The objective of this policy is to: i. ensure the setting fees is compliant with government regulations while supporting strategic and financial imperatives ensure that additional charges levied are compliant with the legal requirements while ensuring coverage of legitimate costs provide clarity regarding the requirements for administration, invoicing, collection and refund of fees. ii. iii. 4 (f) Academic Gowns (g) PhD Cylinder (h) Recess Term fee (i) Late Registration (j) Re-mark Fee (k) Re-take fee (l) Late fees Payment fee (m) Verification Fee (n) Thesis Examination Fee (o) Affiliated Institutions Fee (p) Application Fee (q) Any other fees as may be fixed by Council from time to time G. Fees Regulations 1. General Provisions i. Payment of University fees is the responsibility of students. An account shall be opened for each student in the computerized information system of the University. Students who default on the payment of fees are subject to sanctions, including deregistration, payment of a fine and legal action. ii. Fees are due on the first day of each semester. iii. All students admitted for programmes at the University are personally responsible for the payment of fees. This includes arrangements where students obtain sponsorship for fees and the sponsor defaults. iv. The specific fee applicable is confirmed at the point of admission. v. When there is a review between admission and registration, the applicable fee will be that given to the students at the time of registration. vi. Students repeating a course unit or programme of study will be charged the appropriate fee for the unit or programme for continuing students and those who will have overstayed on the programme. vii. Students repeating course units or programmes where the fee structure has been revised upwards will be charged the revised rates. viii. Every student admitted to a programme of study of Makerere University shall be required to sign and undertaking regarding fees payment. 2 Specific Requirements a) New Students i. Every student admitted to a programme of study of Makerere University will be issued a provisional admission letter with an invoice for payment of the requisite fees. 5 ii. All functional fees and 60% of tuition fees for new joining students must be paid before the admission letter is issued. b) Continuing Students Every continuing student shall pay a commitment fee as may be fixed by the University Council, provided that at the time of approval of this policy the commitment fee shall be UGX 200,000/= (Uganda Shillings Two Hundred Thousand only), before the student is provisionally registered for the subsequent semester. Provisional registration must be completed within the first two weeks of a semester. The commitment fee shall form part of fees due for the semester. A student who is not provisionally registered by the end of the second week of a semester shall be deregistered. However, a student who fails to provisionally register by the end of the second week of a semester for genuine reasons may apply to the Vice Chancellor for special consideration for late registration. Students permitted to complete Late Registration must do so by the sixth week of a semester upon payment of a Late Registration Fee as may be determined by the University Council, provided that at the time of approval of this policy the Late Registration Fee shall be UGX 100,000/- (Uganda Shillings One Hundred Thousand only), this in addition to the commitment fee. All fees should preferably be paid at the start of each semester. However, within the first week of a semester students may choose any of three fees payment windows outlined below for payment of the fees due. i. 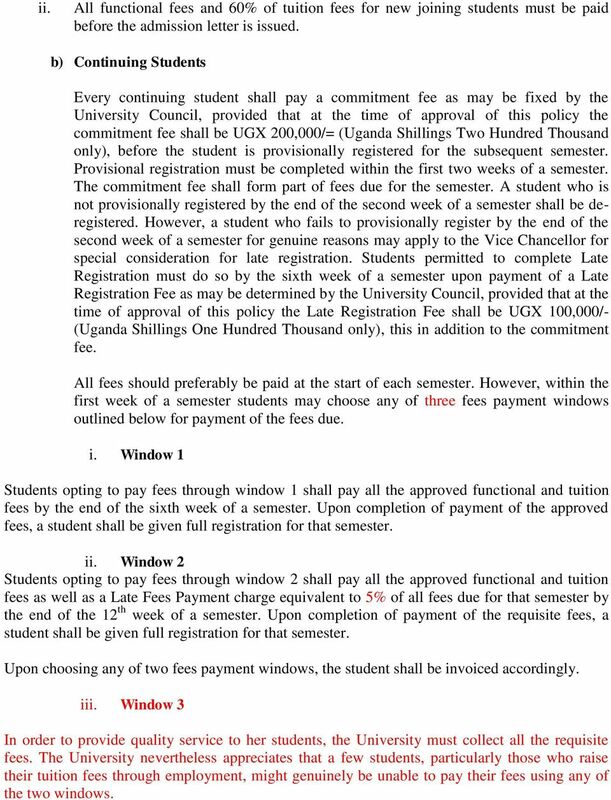 Window 1 Students opting to pay fees through window 1 shall pay all the approved functional and tuition fees by the end of the sixth week of a semester. Upon completion of payment of the approved fees, a student shall be given full registration for that semester. ii. Window 2 Students opting to pay fees through window 2 shall pay all the approved functional and tuition fees as well as a Late Fees Payment charge equivalent to 5% of all fees due for that semester by the end of the 12 th week of a semester. Upon completion of payment of the requisite fees, a student shall be given full registration for that semester. Upon choosing any of two fees payment windows, the student shall be invoiced accordingly. iii. Window 3 In order to provide quality service to her students, the University must collect all the requisite fees. The University nevertheless appreciates that a few students, particularly those who raise their tuition fees through employment, might genuinely be unable to pay their fees using any of the two windows. 6 Students who have difficulty paying their tuition fees due to financial hardship may apply to pay their tuition fee under a monthly payment plan. Students must apply in writing to the Vice Chancellor, and provide documentation as evidence of their financial hardship. Applications are reviewed on an individual basis and arranged on a per-semester basis only. Payment plans cannot be applied retrospectively and are not available to new students. Please note: an administrative fee as may be fixed by Council will be charged for the establishment of a fees payment plan. Students who wish to apply for a payment plan arrangement must submit a written request/application no later than the fee payment due date for the semester in which they are requesting a payment plan. Applications received after the fee payment due date will not be considered. Students permitted to pay by plan will be required to pay the commitment fee before the payment plan will be approved. The application fee will be billed to the student and included in his/her schedule of payments. The remaining balance will be paid under a monthly payment. All fees must be finalised in accordance with the agreed terms and conditions of the individual payment plan and in any case not later than the 12 th week of the semester. Payment plans will be limited to the semester in which the request is made and no further extensions will be granted. The Monthly Payment Plan is available to all undergraduates and graduates. Students desiring to use the Monthly Payment Plan are encouraged to sign up as soon as possible to realize the maximum number of months over which to pay the balance due. There is no interest charge or finance charge (zero percent annual percentage rate) imposed for use of the Monthly Payment Plan. Application forms for this plan may be obtained from the College accountant. Continued participation in the Monthly Payment Plan is contingent upon a satisfactory payment history. 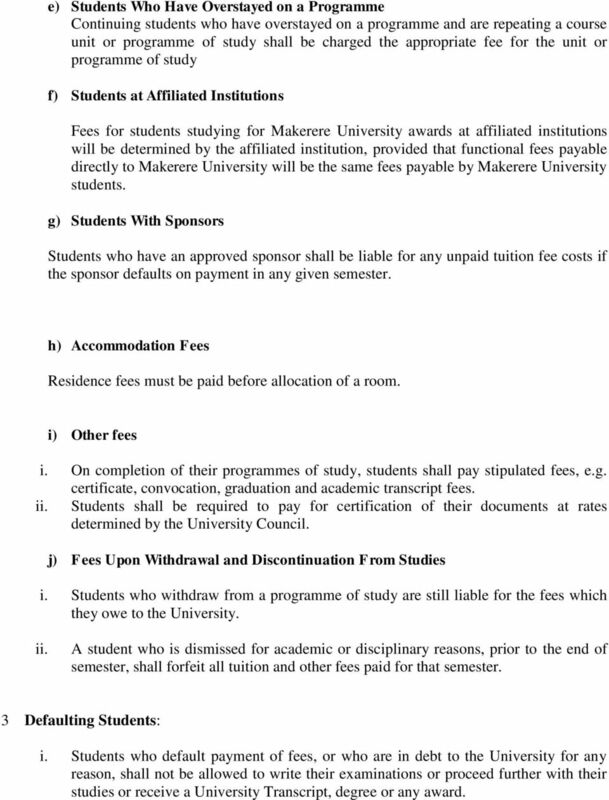 Makerere University reserves the right to deny continued participation to anyone who has previously not complied with the terms of the monthly payment plan billing schedule. c) Prepaid Tuition Plan The University s Prepaid Tuition Plan allows new students to prepay all the semesters in their study plan thereby locking in the rate of tuition in effect at the time of the plan s initiation. Payment must be received before the first semester of the student s study programme. 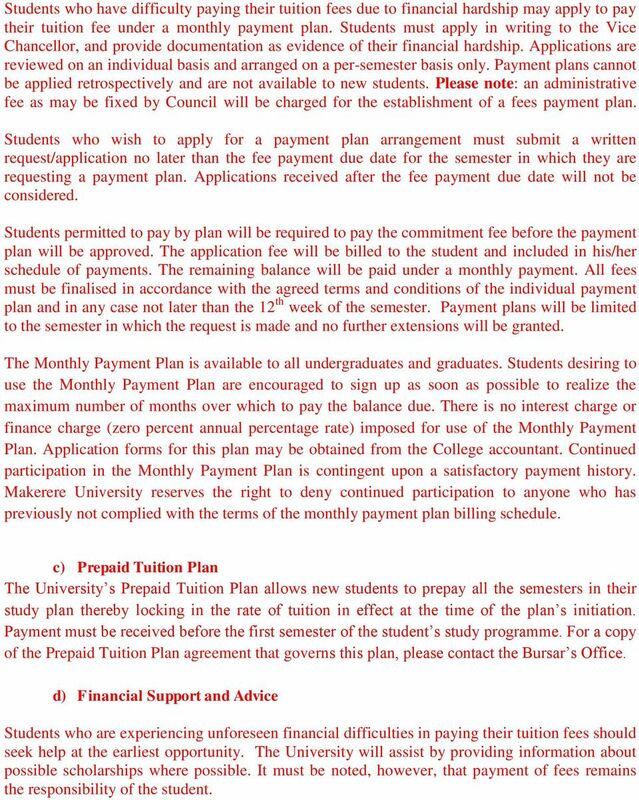 For a copy of the Prepaid Tuition Plan agreement that governs this plan, please contact the Bursar s Office. d) Financial Support and Advice Students who are experiencing unforeseen financial difficulties in paying their tuition fees should seek help at the earliest opportunity. The University will assist by providing information about possible scholarships where possible. It must be noted, however, that payment of fees remains the responsibility of the student. 7 e) Students Who Have Overstayed on a Programme Continuing students who have overstayed on a programme and are repeating a course unit or programme of study shall be charged the appropriate fee for the unit or programme of study f) Students at Affiliated Institutions Fees for students studying for Makerere University awards at affiliated institutions will be determined by the affiliated institution, provided that functional fees payable directly to Makerere University will be the same fees payable by Makerere University students. g) Students With Sponsors Students who have an approved sponsor shall be liable for any unpaid tuition fee costs if the sponsor defaults on payment in any given semester. h) Accommodation Fees Residence fees must be paid before allocation of a room. i) Other fees i. On completion of their programmes of study, students shall pay stipulated fees, e.g. certificate, convocation, graduation and academic transcript fees. ii. Students shall be required to pay for certification of their documents at rates determined by the University Council. j) Fees Upon Withdrawal and Discontinuation From Studies i. 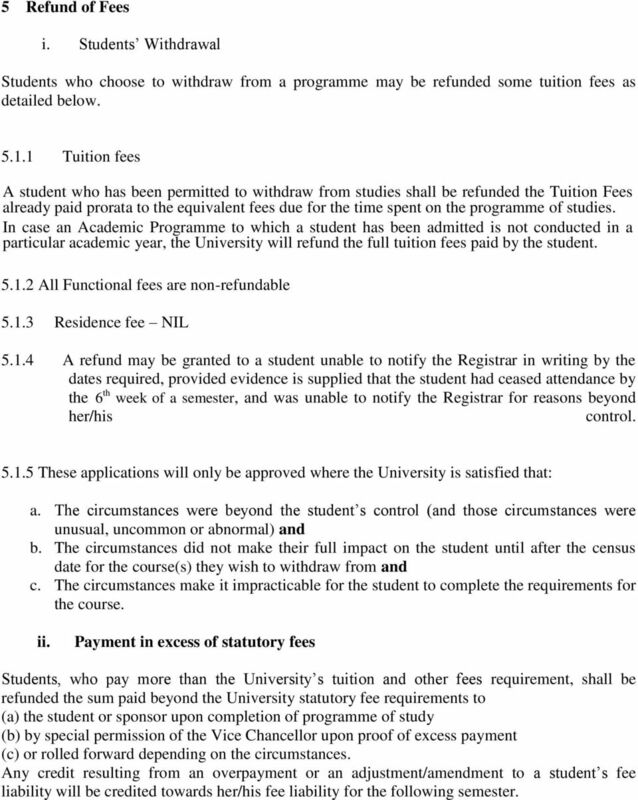 Students who withdraw from a programme of study are still liable for the fees which they owe to the University. ii. A student who is dismissed for academic or disciplinary reasons, prior to the end of semester, shall forfeit all tuition and other fees paid for that semester. 3 Defaulting Students: i. Students who default payment of fees, or who are in debt to the University for any reason, shall not be allowed to write their examinations or proceed further with their studies or receive a University Transcript, degree or any award. 8 ii. A student who fails to pay fees within the stipulated period may apply for withdraw from the programme and on resumption shall be required to pay all the requisite fees. iii. If, with notice, a student's enrolment is cancelled for abscondment from the programme of study and that student is subsequently permitted to have his/her enrolment reinstated, a UGX 500,000/=. re-instatement fee will be levied in addition to the requisite functional and tution fees not paid by the student at the time of abscondment. iv. Non-payment of fees within the prescribed period shall lead to cancellation of registration. v. A student whose enrolment is cancelled will retain her/his fee liability, and readmission in a subsequent year or semester will only be permitted when the debt is paid in. vi. A student who is in debt to the University at the time of graduation shall not be issued with Academic Transcript, Degree or Diploma certificate and will not be permitted to graduate. vii. The University reserves the right to take legal action, where appropriate, to effect recovery of monies from students who leave the University with outstanding debts. viii. Transfer of fees from one student s account to another student s account is not permissible. 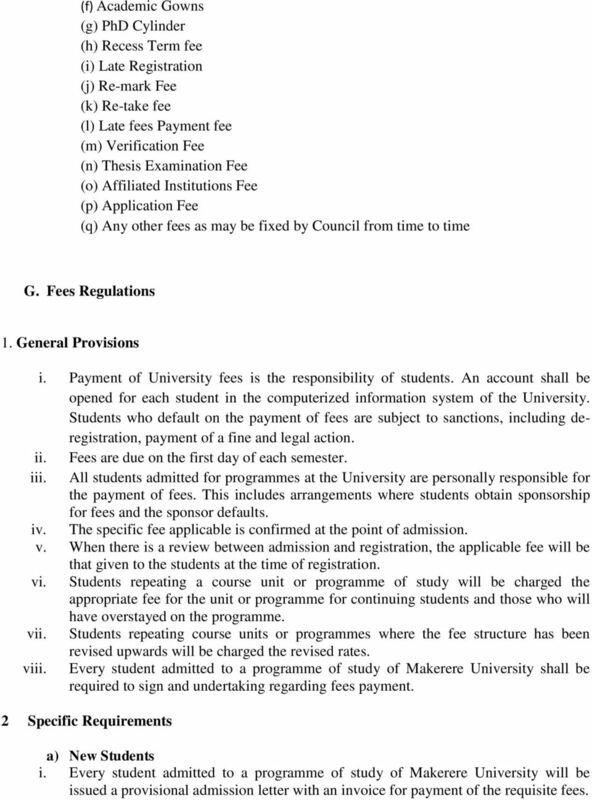 H. Procedure for Paying Fees The following is the procedure for paying University fees: i. Students are invoiced for the fees before the start of the semester. ii. Payments are made to an approved Makerere University Bank collection account. iii. Upon confirmation of payment, receipts are issued by the Finance Department to students after which the student may register on the computerized system of the University. iv. Upon registration an account is opened and maintained in the computerized system of the University for each student. I. 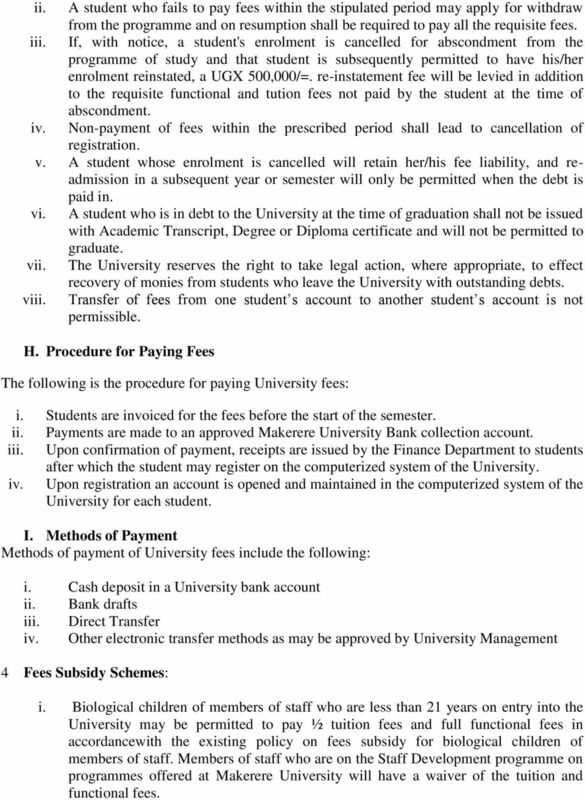 Methods of Payment Methods of payment of University fees include the following: i. Cash deposit in a University bank account ii. Bank drafts iii. Direct Transfer iv. Other electronic transfer methods as may be approved by University Management 4 Fees Subsidy Schemes: i. Biological children of members of staff who are less than 21 years on entry into the University may be permitted to pay ½ tuition fees and full functional fees in accordancewith the existing policy on fees subsidy for biological children of members of staff. Members of staff who are on the Staff Development programme on programmes offered at Makerere University will have a waiver of the tuition and functional fees. 9 5 Refund of Fees i. Students Withdrawal Students who choose to withdraw from a programme may be refunded some tuition fees as detailed below Tuition fees A student who has been permitted to withdraw from studies shall be refunded the Tuition Fees already paid prorata to the equivalent fees due for the time spent on the programme of studies. In case an Academic Programme to which a student has been admitted is not conducted in a particular academic year, the University will refund the full tuition fees paid by the student All Functional fees are non-refundable Residence fee NIL A refund may be granted to a student unable to notify the Registrar in writing by the dates required, provided evidence is supplied that the student had ceased attendance by the 6 th week of a semester, and was unable to notify the Registrar for reasons beyond her/his control These applications will only be approved where the University is satisfied that: a. The circumstances were beyond the student s control (and those circumstances were unusual, uncommon or abnormal) and b. The circumstances did not make their full impact on the student until after the census date for the course(s) they wish to withdraw from and c. The circumstances make it impracticable for the student to complete the requirements for the course. ii. 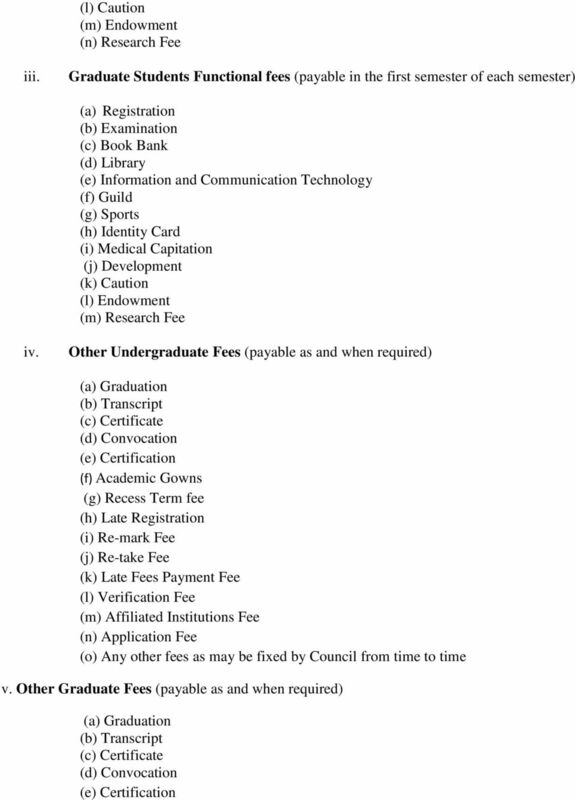 Payment in excess of statutory fees Students, who pay more than the University s tuition and other fees requirement, shall be refunded the sum paid beyond the University statutory fee requirements to (a) the student or sponsor upon completion of programme of study (b) by special permission of the Vice Chancellor upon proof of excess payment (c) or rolled forward depending on the circumstances. Any credit resulting from an overpayment or an adjustment/amendment to a student s fee liability will be credited towards her/his fee liability for the following semester.